The history of the castle begins in the Moorish Al-Andalus era, after the Umayyad conquest of Hispania in the 8th century, when Sintra had two castles. One was located atop of a hill overlooking Sintra. It is known as the Castelo dos Mouros (Castle of the Moors), and is now a romantic ruin. 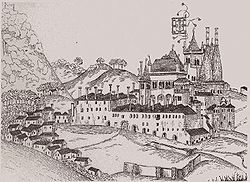 The second castle was located downhill from the Castelo dos Mouros, and was the residence of the Islamic Moorish Taifa of Lisbon rulers of the region. Its first historical reference dates from the 10th century by Arab geographer Al-Bacr. In the 12th century the village was conquered by King Afonso Henriques, who took the 'Sintra Palace' castle for his use. The blend of Gothic, Manueline, Moorish, and Mudéjar styles in the present palace is, however, mainly the result of building campaigns in the 15th and early 16th centuries. The Swan Room (Sala dos Cisnes) in Manueline style, named so because of the swans painted on the ceiling. The number of painted swans, the symbol of the house of the groom, Philip the Good of Burgundy, equals to the bride's, Infanta Isabel, age – 30. Magpie Room (Sala das Pegas); the magpies (pegas) painted on the ceiling and the frieze hold the emblem por bem (for honour) in their beaks. This relates to the story that the king John I was caught in the act of kissing a lady-in-waiting by his queen Philippa of Lancaster. To put a stop to all the gossip, he had the room decorated with as many magpies as there were women at the court (136). John I's son, King Duarte I, was very fond of the Palace and stayed long periods here. He left a written description of the Palace that is very valuable in understanding the development and use of the building, and confirms that much of the palace built by his father has not changed much since its construction. Another sign of the preference for this Palace is that Duarte's successor King Afonso V was born (1432) and died (1481) in the Palace. Afonso V's successor, King John II, was acclaimed King of Portugal here. Main courtyard with a Mudéjar-style mullioned windows and portal and 16th-century geometrical tile decoration. 16th-century Sala dos Brasões. The azulejos are of 18th-century. 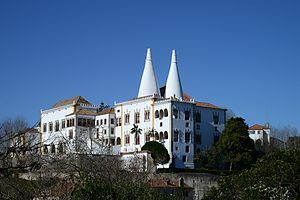 ^ The National Palace of Sintra Guide, 1. 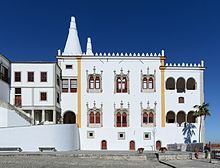 Wikimedia Commons has media related to Palácio Nacional de Sintra. This page was last edited on 1 October 2018, at 09:46 (UTC).